An overview of the information Geoffrey Blair had regarding the abuse and isolation of Dolores by her youngest son Ethan was presented in Geoffrey Blair Returns. We'll examine the letter forwarded to Geoffrey Blair by the HSE Community Welfare Officer purportedly sent by “Dolores.” As we'll see in a later section, this letter (and others penned to the HSE) played an important role in the decision by HSE Elder Abuse not to intervene in Dolores' situation. In the belief that some understanding of the history and structure of the HSE Elder Abuse will make it easier to understand the actions they took (and didn't take), we'll offer an overview of the HSE Elder Abuse as we understand it. For those interested readers, click the blue button. 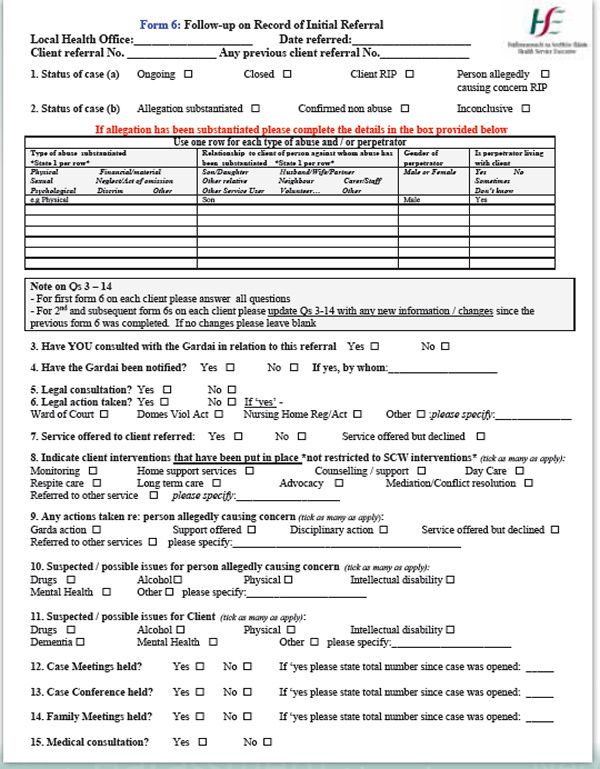 Form 5 is an anonymous form that the HSE uses to collect data on Elder Abuse cases. The data is seen on reports such as Open Your Eyes 2010 from the HSE. All Form 5s are forwarded to the dedicated Officers for Elder Abuse for validation, coding and entering into spreadsheets. It is obviously a simple form, but in aggregate provides some view of Elder Abuse in Ireland. It reveals that only 4% of Elder Abuse referrals come from the GPs (that is, family physicians) and only 5% are reported by the victims themselves. The Public Health Nurses are far and away the ones most likely to report Elder Abuse; they account for over a third of all referrals.. Family members such as Saoirse accounted for a mere 9% of referrals. It also reveals that the caseloads for the Senior Elder Abuse Case Workers are climbing substantially. From 927 referrals in 2007, the number in 2010 had climbed to well over 2100. The HSE South region had the most referrals in 2010: 810. HSE South has about 25% of Ireland's 65 and older population, yet accounted for nearly 40% of Elder ABuse referrals. In HSE South there were still 86 open cases from previous years. Numbers for each Local Health Office are not available, but on average the Elder Abuse Case Workers in HSE South were dealing with 100 cases each. Assuming weekends off and standard 29 day bank holiday and vacation time (excluding sick days), each case on average would be allotted less than 18 1/2 hours of focus per year. Of course we are not factoring in the paperwork, meetings, and all the rest of the responsibilities that go hand in hand with government agency employment. One of the predictable effects of the heavier caseloads is what appears to be a bias towards closing cases. For instance, in 2009, 9% of cases were closed within a month. In 2010, that rate had increased by over 260%. It should be noted that the number of cases from HSE South have been reported to be on the low side, as there were problems in HSE South collecting and maintaining the statistics in 2010, due to the Dedicated Elder Abuse Officer position becoming vacant. Looking at what data is available, we estimate that Geoffrey Blair's actual caseload was in the neighbourhood of 130. This would allow him less than 14 hours per referral per year, or about 15 minutes per week. Looked at another way (the most optimistic way we believe), with an average reported case length of 2.1 months, at any given time about 35 cases were active, allowing Geoffrey Blair an average of an hour a week per case. Within that timeframe he would be expected to fill out the forms, investigate the allegations of abuse, interact with other healthcare professionals, communicate and offer advice to family members, and meet with legal professionals, Gardai, etc. as required. He would also arrange and hold family meetings, case meetings, and conference meetings as required, and generate the expense reports, call logs and all the other paperwork that the system needs. Additionally, Geoffrey Blair would attend training sessions, public awareness forums, speak at seminars, and provide training to other public health workers. Expending more time on one case would mean less time for every other case. As far as can be determined, Senior Elder Abuse Case Workers have no staff under them. Geoffrey Blair always answered his own phone, made his own calls, wrote his own letters and emails. As far as we can determine, there was no secretary to offer even basic support to him. These cases are real people, many with life threatening, urgent situations. Like Dolores, for example. It seems painfully obvious to us that 15 minutes to an hour a week is frighteningly inadequate. Dolores' Form 5 (and the follow-up Form 6's) has been requested under Ireland's Freedom of Information Act. The FOI in Ireland is relatively new. Compared to other countries it was quite weak when introduced in 1997, and was further weakened in 2003. The members of Dolores-Maxwell.com who are seeking these forms fully expect to be denied, and will then go through the review, the appeal, and finally the Office of the Information Commissioner. It is fully expected that sight of these forms will be obtained somewhere during that process. [Editor's note: Geoffrey Blair was required to fill out a Form 6, the “Follow-up on Record of Initial Referral” every six months, and when Dolores' case was closed. A blank one is seen below. For whatever reason, “required” does not mean that he did. Geoffrey Blair eventually filled out but one Form 6, some nine months after Dolores died. Its contents are troubling for a variety of reasons, and in our view begs the question of whether the statistics reported by HSE Elder Abuse Services every year have a basis in reality. Worse, it opens questions about the underlying foundation and effectiveness of the HSE Elder Abuse Services. We take note of item number 14. Saoirse had requested that Geoffrey Blair facilitate a family meeting from her first contacts with Elder Abuse in December 2009. She had sought to enlist her siblings to have a family meeting (which of course was one aspect of the hoped for December 27 meeting that was prevented by Ethan). Also, she had broached the subject of a family meeting with Dolores' solicitor Damian Brass. Saoirse would continue to ask, request, plead, even beg Geoffrey Blair many times in 2010 for a family meeting. It was never even attempted. Concerning item number 8, “client interventions”, Dolores was already availing of Home Support Services and Day Care (at the Tagoat Senior Centre). According to Geoffrey Blair, Monitoring was activated for Dolores. It is difficult to ascertain what the HSE's monitoring consists of, or how effective it may be. In Dolores' case, we think it fell far short of a reasonable level that might have afforded her any protection from the escalating abuse she was suffering from Ethan. There was no concern shown when Dolores suffered a broken shoulder, facial lacerations and bruising in August of 2010; Dolores received treatment for this both at her GP and Wexford General. Although Saoirse had requested that Geoffrey Blair monitor, at least at the most basic level, Dolores' attendance at Tagoat and use of other support services, Geoffrey Blair was unable to give an account of Dolores' attendance at Tagoat Daycare Centre, let alone who would cancel her visits (we know that at least on some occasions Ethan himself would cancel Dolores' visits to Tagoat). He was also unable to provide an account of the Home Care visits and cancellations, let alone who had cancelled them and for what stated reason. He was unaware of the various hospital admittances and out-patient treatments Dolores had in 2010, and was unaware of Accident and Emergency visits made by Dolores. He was also unaware of ambulance call–outs to Dolores at her home in Rosslare. Perhaps the clearest indication of the HSE Elder Abuse Services monitoring of Dolores' situation and safety is seen in this: Dolores was admitted to Wexford General Hospital on September 2, 2010 for about a week, and again on September 26, in critical condition. In response to a query a few days after this September 26 admission regarding Dolores, Geoffrey Blair responded in an email that Dolores was fine, had been spending a lot of time in Dublin (Bray) lately, and the HSE Elder Abuse Services were monitoring the situation. We consider it self–evident that whatever level of monitoring, if any, that the Elder Abuse Services were actually doing was woefully inadequate, to Dolores' great detriment. Geoffrey Blair received the letter from “Dolores” sent to the Community Welfare Office in Wexford sometime in January. Saoirse learned of this letter during a phone call to Geoffrey on January 22. Sight of this letter was requested under FOI and HSE refused to release it. Dolores-Maxwell.com obtained a copy of this letter by other means. Ethan also included his letter to the Bray Gardai. It is curious to note that “Dolores” did not address this letter to Geoffrey Blair, mention him by name, or send it to HSE Elder Abuse. This is curious; Geoffrey Blair had introduced himself to Dolores, and indeed gave her his card. The date of his visit is also incorrect. Geoffrey Blair had visited Dolores on December 17 (less than two weeks before this letter was written), not December 11. (The usual typo, spelling or grammatical mistakes so common in Ethan's correspondence is evident here.) This once again is the voice of Ethan. Dolores never spoke or wrote in such a manner. Dolores never told any one that she didn't want to see her family. She certainly made no mention of not wanting to see either her children or grandchildren during the conversation she had with Saoirse on January 2, three days after “Dolores” seemed so adamant about it in “her” letter. On the contrary, many happy, smiling photos of Dolores with her children and grandchildren speak of the joy Dolores had with them. We do not forget that the Public Health Nurse was told that all of Dolores' children lived abroad. That is, of course, except for Ethan. Nor do we forget Ethan's attempt (nearly successful) to prevent any of her children, grandchildren, brother and friends knowing that Dolores was dying in the hospital the following September. The phrase “I am fortunate to be able to attend the day centre in Tagoat” would later seem to be used as a justification by Geoffrey Blair to not intervene to help Dolores; he seemed fearful that any attempt by him to aid Dolores would jeopardise her attendance at Tagoat Senior Centre. The question must be asked: If Geoffrey Blair did not consider that there was abuse in Dolores' life, why would he be fearful that she would somehow be prevented from going to Tagoat if he pursued the matter? We have no answers to this, nor has Geoffrey Blair provided any. Geoffrey Blair was unsettled by the reference once again to Power of Attorney. He did not see how that was pertinent to Dolores' children being unable to contact or see her. Although he was informed by the PHN that Ethan was claiming Power of Attorney over Dolores in 2009, and would continue to do so throughout 2010, including (according to reports) during Dolores' admittance to Wexford Hospital, it is believed that Geoffrey Blair never sought to find out whether or not Ethan actually had the Power of Attorney he claimed. We will state again: There was never a Power of Attorney registered for Dolores. Ethan's claims to the contrary were untrue and illegal. Not only is the wording and voice in the two letters incredibly similar, but the author is unaware of how many Attorneys Dolores appointed when she made the Enduring Power of Attorney. We note the author states that the EPA was made “…some time ago.” Letters written months after this will try to put the event in much more recent times. At the time of the letter, it had been about six months since Dolores made her EPA. “For my own records and to pass on to my solicitor, please provide available information as to why you called to my home on 11.12.09.” This is also curious. Dolores was home when Geoffrey Blair visited her (on December 17, not December 11). He introduced himself, spoke to her, told her why he was there, enquired after her welfare, left his card. We deem this request to be nothing more than Ethan's transparent attempt at learning what exactly was happening after his actions on December 3, and his refusal to allow Dolores to see her family for Christmas on December 27. Mentioning solicitors is a classic and repeated behaviour by Ethan. We have no doubt this letter was created by Ethan. Many of his recurrent catch-phrases and themes seen in other correspondence and texts from him are evident. Finally, for reasons we won't divulge at the moment, we believe that Ethan in fact forged Dolores' signature on this letter (and many other documents purported to be from Dolores and Cecil). We will report that members of Dolores-Maxwell.com did indeed consult with a graphologist, with disturbing (although not unexpected) results, leading to a Forensic Document Examination of items of interest. Geoffrey Blair as far as can be determined never sought to ascertain the veracity of this letter, even with the information provided about Ethan's forgeries and aliases that were known at that time. He never, as far as can be determined, visited or called Dolores to ask her, "Mrs. Maxwell, I received your letter, and have a couple of questions about it," to see if in fact Dolores even had knowledge of the letter. He never, as far as can be determined, ever visited or spoke to Dolores after December 17, 2009. Members of Dolores-Maxwell.com are actively seeking information and understanding regarding the investigations of Elder Abuse incidents by Senior Elder Abuse Case Workers. Other than speaking with the Public Health Nurses, we cannot provide a picture of what the investigations entail, or even what they are supposed to be. Through the light of the events of 2010 concerning Dolores, we can report what the investigation into Dolores' abuse by her youngest son Ethan was not. It was not speaking to neighbours who knew Dolores, even neighbours that had witnessed abuse towards Dolores by Ethan; neighbours Geoffrey Blair was made aware of early on. It was not speaking to the abuser, Ethan. It was not contacting or calling Dolores' other eight children to confirm or deny Saoirse's fears for her mother's safety. It was not establishing the veracity of any documents provided to them from any source; even though Ethan's extensive history of forgeries and identity switches were made known to Geoffrey Blair. It was not querying the Gardai about past instances of abuse or call–outs to the Maxwell residences. It was not reviewing Dolores' HSE medical records for signs of abuse. It was not taking any action to confirm or deny the truth of the financial abuse Dolores suffered from Ethan. It was not checking with the phone companies to ascertain the state of Dolores' phone lines. It was not contacting the family doctor from Dublin who had urged the family to seek treatment for Ethan's violence. It was not making a simple call to Mr. Taxi Driver about the Taxi Letter. It was not calling Dolores' only brother seeking his knowledge of Ethan's abuse. Nor was it a simple query to the Courts Services to verify whether or not Ethan had Power of Attorney. It was not contacting “family spokesman” Lloyd Montgomery. 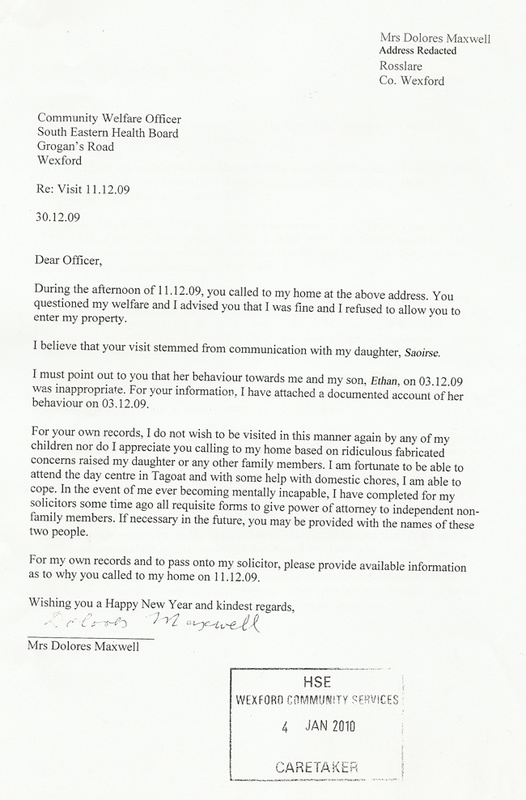 We are left with the feeling that the “investigation” into the abuse of Dolores Maxwell just…wasn't. [Editor's note: What we regard as the HSE Elder Abuse Services' failure to provide anything other than false hope in Dolores' case will inexorably unfold as this site is developed. In the next part of A Winter's Tale we will see the response by Dolores' solicitor Damian Brass to the letter written to him by Saoirse, among other things. It is called Damian Brass Responds.